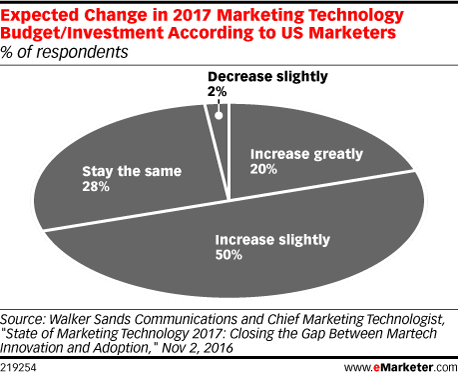 Data is from the November 2016 Walker Sands Communications and Chief Marketing Technologist report titled "State of Marketing Technology 2017: Closing the Gap Between Martech Innovation and Adoption." 335 US marketers were surveyed online during September 15-October 11, 2016. The survey was limited to professionals currently working in the marketing department of a company or organization. Respondents identified their marketing role as CMO (7%), consultant (7%), coordinator/specialist (20%), creative (16%), manager (22%), owner (8%), VP/director (14%) and other (6%). Respondents identified the number of employees at their company as 1-50 (32%), 51-99 (14%), 100-499 (24%), 500-999 (9%), 1,000-4,999 (11%) and 5,000+ (10%). Respondents identified their marketing budget as less than $100K (29%), $100K-$499,999 (20%), $500K-$999,999 (10%), $1 million-$4.9 million (16%), $5 million-$9.9 million (8%), $10 million-$99 million (10%) and $100+ million (6%). Respondents identified the number of marketing employees at their company as 1 (9%), 2-3 (23%), 4-5 (13%), 6-10 (18%), 11-50 (20%), 51-99 (9%) and 100+ (8%). Walker Sands Communications is a marketing and public relations firm that specializes in media relations for technology companies. Chief Marketing Technologist is a blog focused on marketing technology.